Sandra Ross sent me copies of 2 books that she arranged to have published after the death of her husband, Edward S Ross a few years ago. Any Californian entomologist my age who visited the California Academy of Sciences in San Francisco would know Ed Ross. 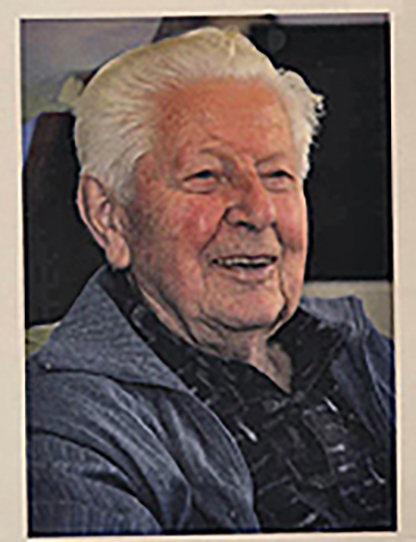 He was an icon of the Academy. In the "old" Academy, his office was strategically placed so that all visitors to the department had to go past his open door. If he was there, and he usually was, you had to stop and "there went the morning"! But I digress. I first met Dr Ross when I was about 12 yrs old when my father took me up to the Dept of Entomology on the suggestion of Bob Dempster who was in the Ichthyology Dept. He and my father and my uncles were all members of the San Francisco Aquarium Society. We always had aquaria around the house and I still maintain that hobby. At that meeting my father told Ed that I had a more than average interest in insects and what should we do about it? Ed said we will put him to work now. I then joined Paul Opler and another fellow transferring butterflies in envelops into more permanent accommodation in the collection. Paul and I have remained friends over the years but have not seen each other for several decades. Ed became very influential in my life. He suggested to my mother that I should take up photography and that I should start out at "a professional level". No cheap cameras for me! My first camera was and Ashahi-Pentax with a close-up lens. 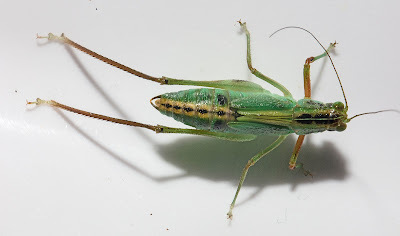 I have always been attracted to orthopteroid insects. This I attribute to my grandmother who used to collect with me at our summer place in Rio Nido, north of San Francisco. She made my first insect net from a "landing net" she had for fishing. I recall is had a collapsable rim and an extension that allowed me to get to the Tiger Swallowtails that were high in the mulberry bushes. It was also useful in netting the Platylyra katydids that landed on the house, attracted to the lights. The attraction of orthopteroid insects was nurtured at the Academy by the array of US and foreign specimens Ed had collected. 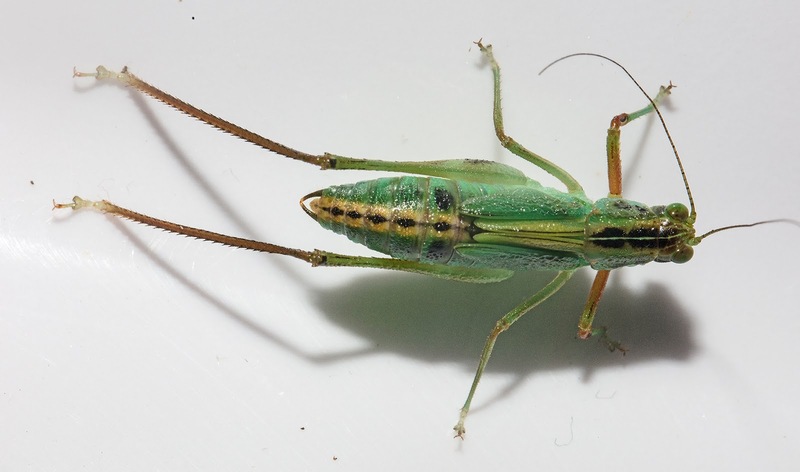 Ed once remarked on his way out the4 door on one of his many collecting trips in South America, that he wished someone would take up the study of the Orthoptera. So with the aid of Don MacNeill and Jacques Helfer I began to study Orthoptera in earnest. That's where it all began. 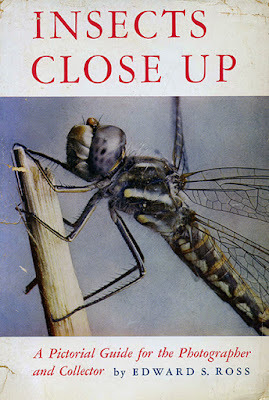 When I was about 13 Ed's classic book, Insects Close Up came out. My very worn copy of the book. Later when he visited Australia, he autographed it. Ed was aware of the "digital generation" that was rapidly approaching. But as far as I am aware he stayed away from it saying he was just "too old" to take it on. But he knew it was the way of the future and photography would never be the same as he knew it. 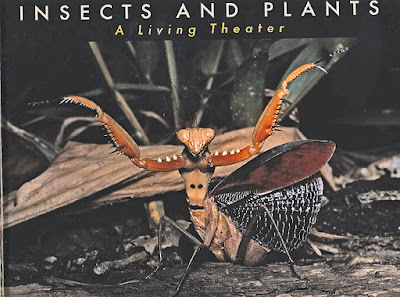 Insects and Plants is a wonderful pictorial adventure illustrating the wide range of insects, their habits and their role in the scheme of things. 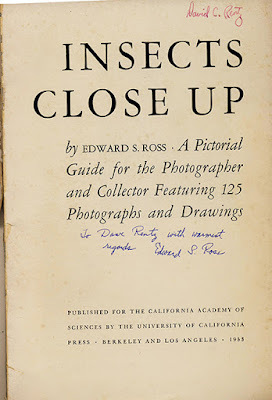 Western US entomologists will recognise many of the photos having seen them in any of the many talks Ed gave to the Pacific Coast Entomological Society, the California Academy of Sciences and the Explorer's Club of San Francisco. I recall many Saturday afternoons at the Academy where Ed was featured showing slides of his recent trip to the Amazon, Africa or India. The our talk always lasted twice that long with many asides and to overflow audiences. Ed trips lasted for months. He usually went off salary but was supported by the National Geographic, Explorer's Club as well as wealthy friends like Van Davis. I recall accompanying him down to the docks on SF Bay where he picked up his field vehicle returning from India. I can still remember that "odd smell" on the ship which was from the tons of copra that was being imported for processing. The main stated purpose of all his trips was to survey for the Embioptera--the web-spinning insects. These insects occur on tree trunks or under rocks. It did not matter if Ed collected many or few specimens. He developed a way of rearing the insects so that a few or even a few eggs would develop into a colony of hundreds of individuals. He collected samples of the webbing which inevitably contained eggs. He would tease the webbing into vials which would be sent by air back to the Cal Academy where the redoubtable, ever-faithful Peter Rubtzoff, would put them into culture. They discovered that dried leaves of the California Live Oak, Quercus agrifolia, was the perfect growth medium for the web-spinners. They thrived on it. Thousands of cultures were maintained and harvested at the Academy over the years. On all of his trips, a young entomologist accompanied Ed with the sole purpose of collecting insects. The result is hundreds of thousands of insect specimens in the CAS collection, many destined to become types. Visitors were invited to "go collecting" amongst the thousands of unmounted specimens. Insects and Plants uses Ed's wonderful photographs to illustrate many aspects of insect ecology in a way that has not been done before. And this was in the era before digital photography so everything had to done correctly or there was no result. It was not easy to have film developed in some the places Ed & Sandy visited. But somehow he got it right! Ed always had an interest in the cultures of the people in the countries he visited. He envisaged a major treatise on the many peoples he photographed. He provided National Geographic and other major publications with articles and beautiful photographs. In 1970 Ed and Sandra Ross visited Afghanistan. Even though the country had been invaded for hundreds of years, this was a time of relative peace. Afghanistan at Peace is the result. 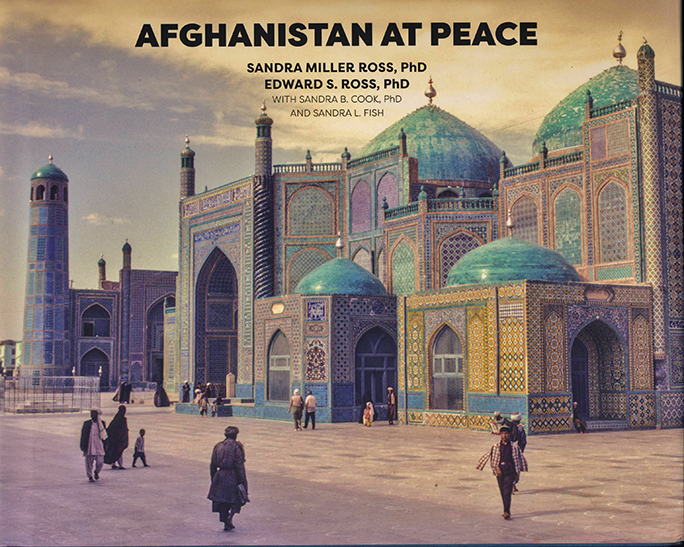 His and Sandra's photos reveal what a wonderful place it was before all the bombing. You can tell from the photos that the people seemed happy and productive. The landscapes and monuments are spectacular to say the least. The photos (mostly of men because women should not be photographed) capture the serenity of a poor but beautiful country. This is an account of what it was in the 70's in Afghanistan. Who would have known what was to come? The Insects and Plants book can be ordered from Bioquip. 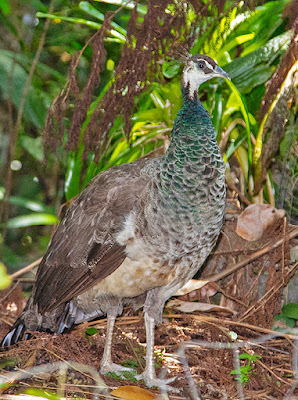 This peahen has been around the garden for the past week. 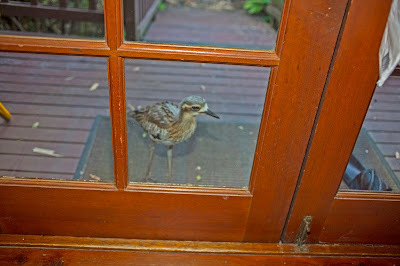 It comes right up to the door and would come into the house if it got the opportunity. Imagine the kerfuffle with a bird this size flying around the house. 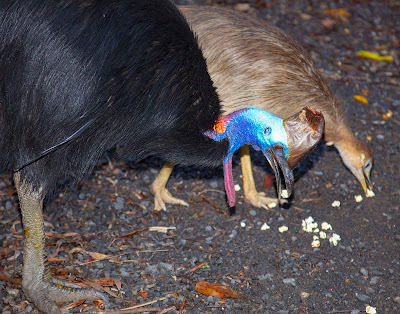 It has happened with Brush Turkeys and an open door! There were actually two! How lucky. But I haven't seen them since! What's this high in the Jakfruit tree? It's a striped possum in its glory--inside a rotting jakfruit. See: http://bunyipco.blogspot.com/search?q=Striped. 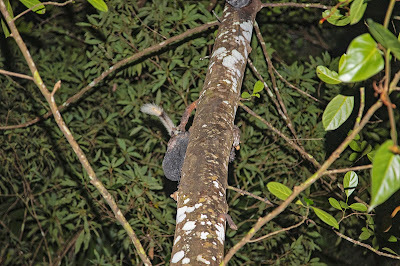 These animals feed on a variety of foods and can be heard in the trees when they find something of interest. They are usually very wary. 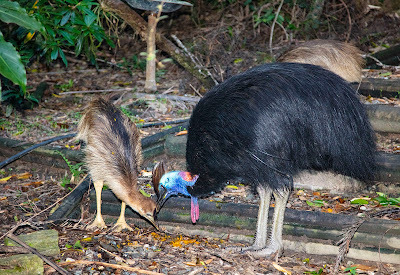 After a few weeks absence, the male cassowary and his 2 chicks made an appearance. Mr Cassowary, 40+ yrs old! The bubs are doing well. 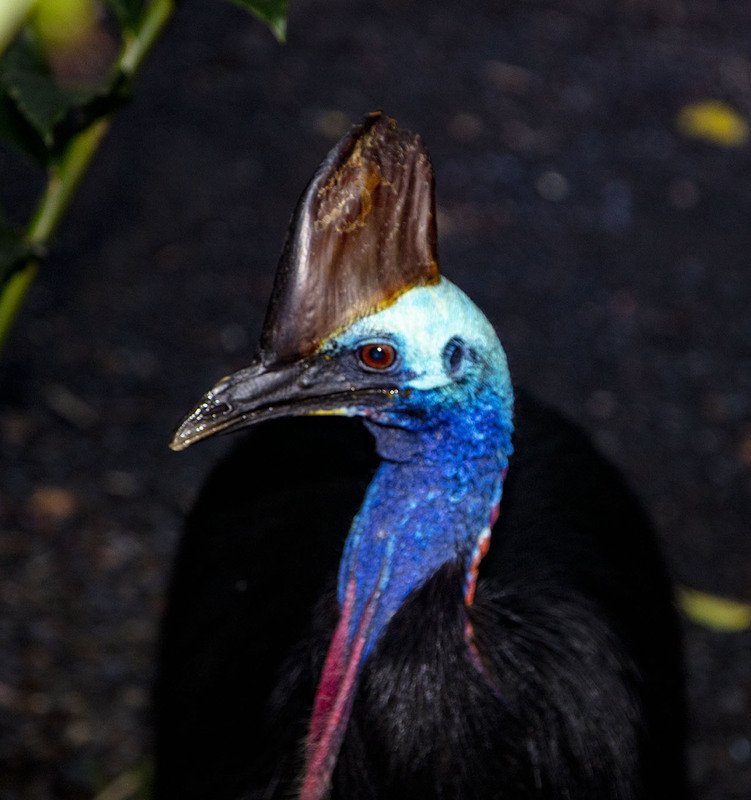 Note the developing wattles and the casque. 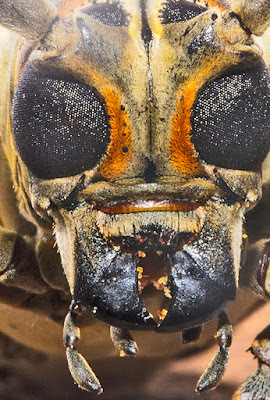 A close-up look at the heads of many insects suggest their function---sometimes, but not always. 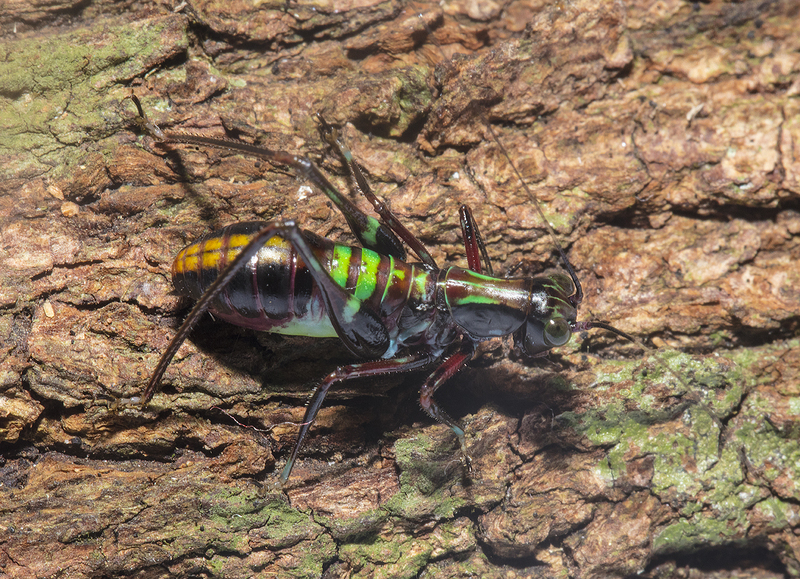 Tiger Beetles, Carabidae, Cicindelinae, are not named for tiger-like stripes but for their predaceous habits. Most are diurnal and patrol stream and lake shores where they hawk smaller insects. Not all have such habits, see. 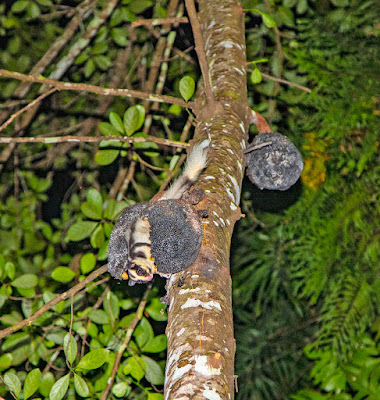 In north Queensland several species perch on leaves and tree trunks and lie in wait for unsuspecting prey. Other beetles like the long-horn Rosenbergia megalocephala, possess powerful mandibles that can deliver a painful bite, but that is not their primary function. 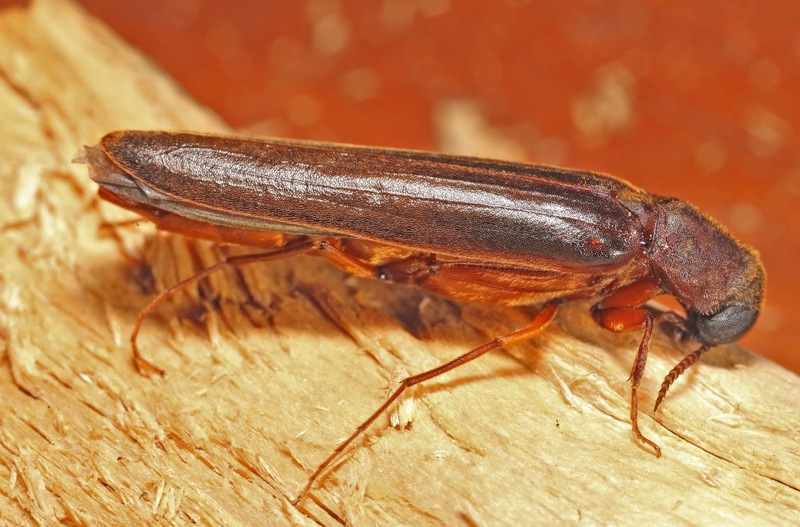 These beetles are wood borers and require strong mandibles to tear into rotting wood to lay their eggs. Rosenbergia megalocephala is a fairly common visitor to the lights in the rainforests of Kuranda. 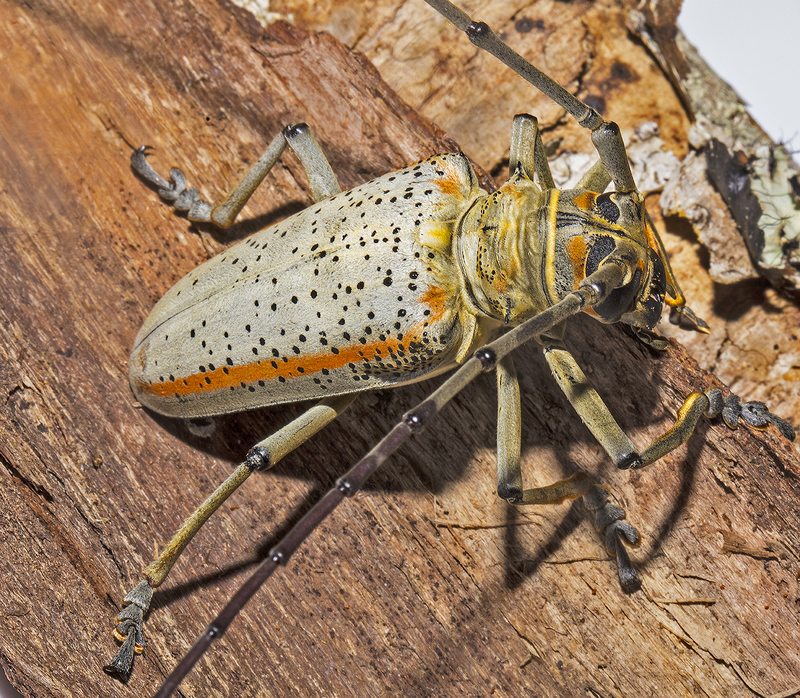 It is a stunning large beetle and a favourite amongst beetle collectors. The mandibles are massive and flattened for scooping and tearing. 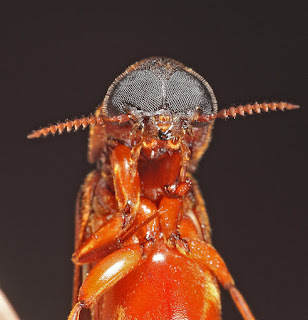 Massive muscles provide these beetles with effective defence as most beetle collectors can confirm. 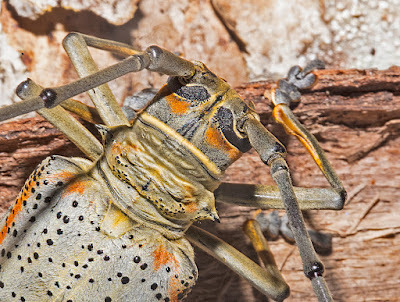 The giant longhorn, Xixuthrus microcerus, is amongst the largest of long-horns in the far north of Australia. It is fairly common and capable of a very effective bite. The elytra are very flexible and if the collector (or other predator) is unwary, the beetle can easily rotate its body and deliver a stunning bite. Lymexylid beetles often come to the light sheet at night. They can be found during the day in leaf litter or, more rarely, at flowers. 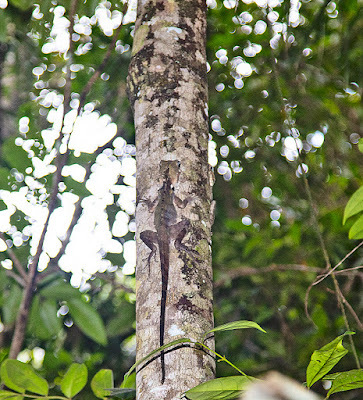 This one is in the genus Melittomma. Larvae of some species tunnel in decaying wood and feed on associated fungi. The stains that result cause the timber to be worth less to the industry and the beetles are consideered pests. The mouthparts are very small and somewhat retracted into the head. Lymexylid mouthparts are small compared to many other beetles. Stag beetles (Lucanidae) are so-called because of their large mandibles. 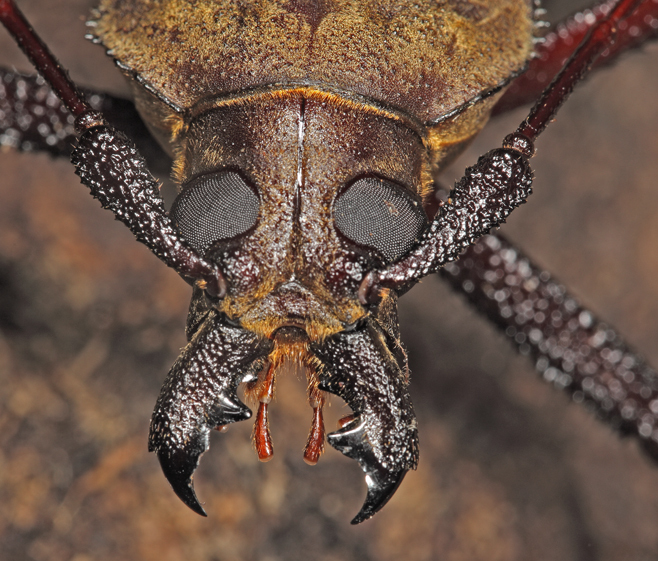 In males the mandibles are not used for wood-boring but in jousting with rivals for females. Ryssonotus nebulosus males are impressive. 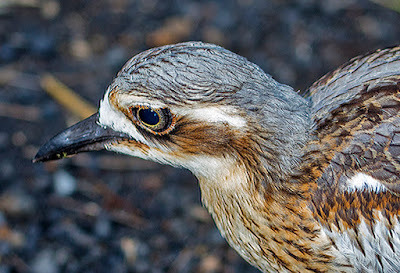 The internal surface of each mandible is lined with brown hairs. 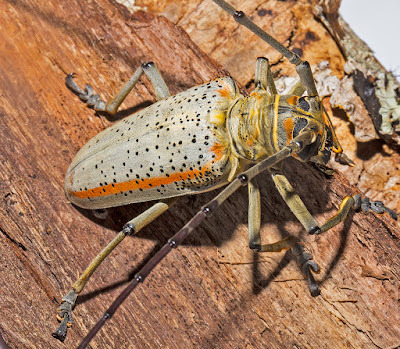 This beetle has been found to breed in introduced willows as well as several native Australian trees. 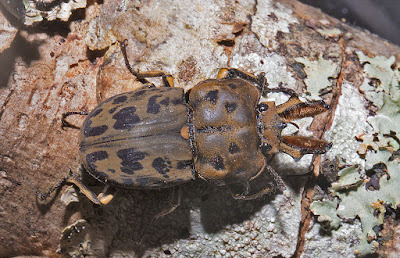 The most iconic of Queensland beetles is Phalacrognathus muelleri. 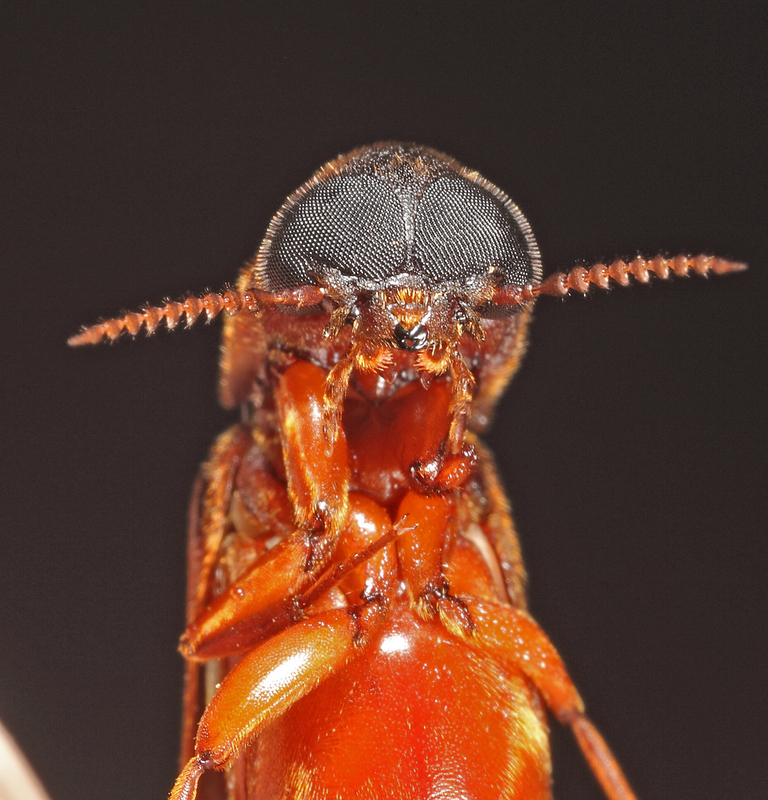 The length and development of mandibles varies in males. The individuals with the largest mandibles are said to be "preferred" by females. 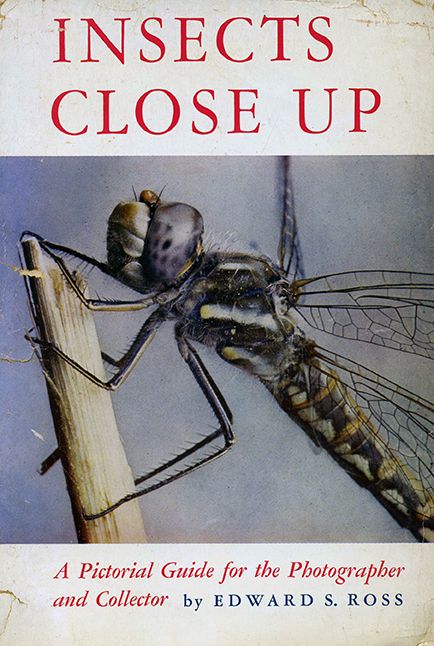 It's a bit of an odd coincidence that two books dealing with the photography of Australian insects have been published in the last 6 months with "Minibeasts" in the title. Both authors were completely unaware what the other was doing. The latest book on "Minibeasts" is authored by Alan Henderson who together with his wife Deanna own a the Minbeasts Wildlife business operating out of Kuranda, Qld. Alan's book is based on Australian insects with a few examples added from their time in Costa Rica. Like Densey Clyne's book, see, the photography is excellent. Both authors are superb photographers. 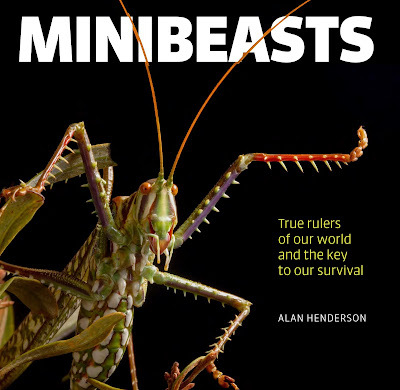 Alan's book also includes stunning photos of spiders, millipedes and other invertebrates. Many of the subjects have never been photographed before. The photos alone are worth the price of the book but the book contains a great deal of information. Each chapter portrays a topic whether it be the role of colour in insects, creatures looking after their offspring or the host of predators and recyclers in the fauna of leaf litter. This book is a wonderful addition to the naturalist's library, published by Exisle, Chatswood, NSW, $29.95. This is what greeted us this morning. 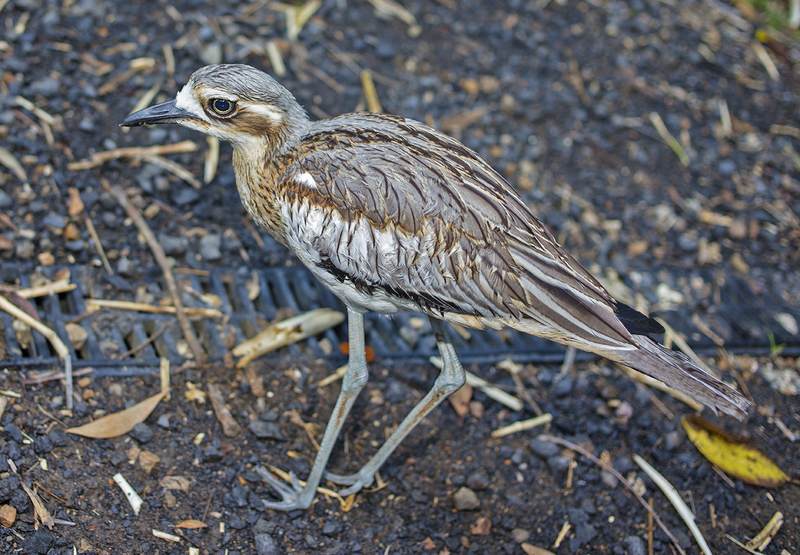 It's fledgling Bush Stone Curlew or Bush Thick-knees, Burrhinus grallarius. 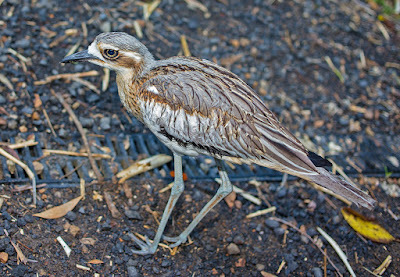 Bush Thick-knees live in areas of open woodland or along rainforest margins where there is open ground. They frequent cemeteries, parks and roads in suburban areas. 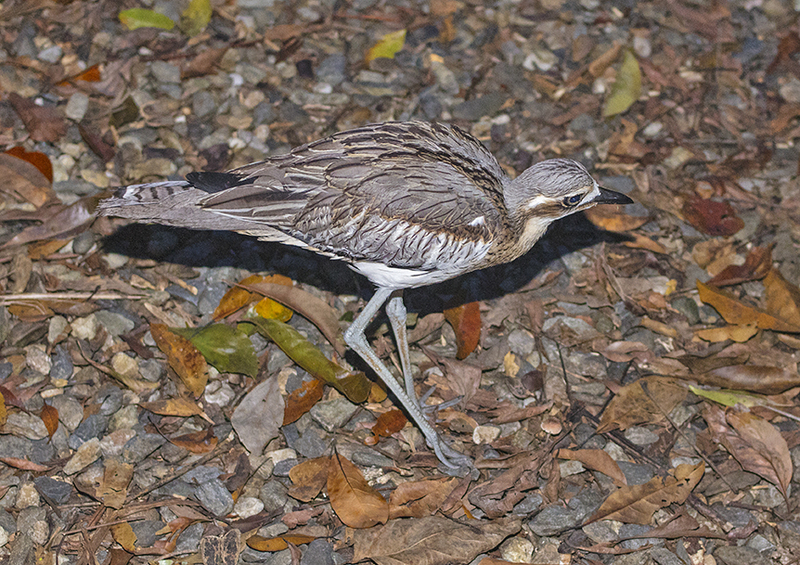 They even nest in hotel gardens or in planted grounds around hotels in Cairns. As adults they are about the size of a bantam chicken. They mate for life and do not venture far from their home breeding grounds. Once nesting is over, they often form small flocks of up to 20 birds. 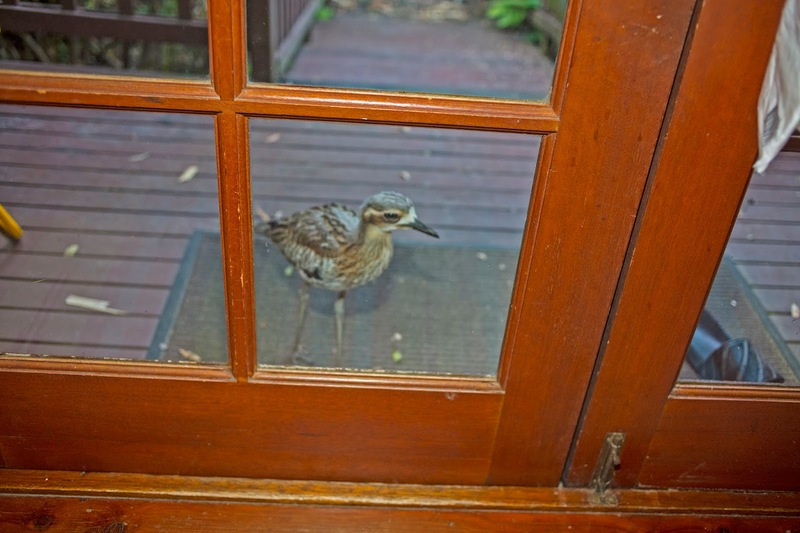 This little fellow, dubbed Charlie, was obviously raised by a wildlife carer and was unusually tame--and hungry. After a few phone calls Charlie was provided with a supply of mealworms and reunited with his or her carer for further rehabilitation before being released. 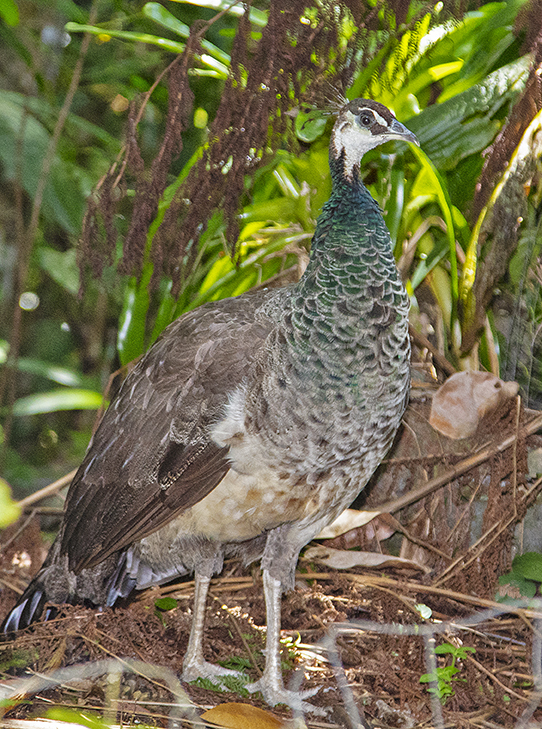 Charlie is a great example of an animal with protective coloration. 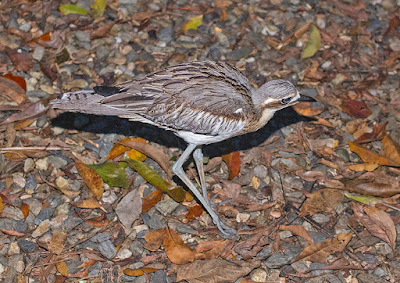 Amongst leaves and gravel the bird is well concealed from predators. Nesting or resting birds usually remain motionless until the last minute when they erupt with a series of hisses and displays. 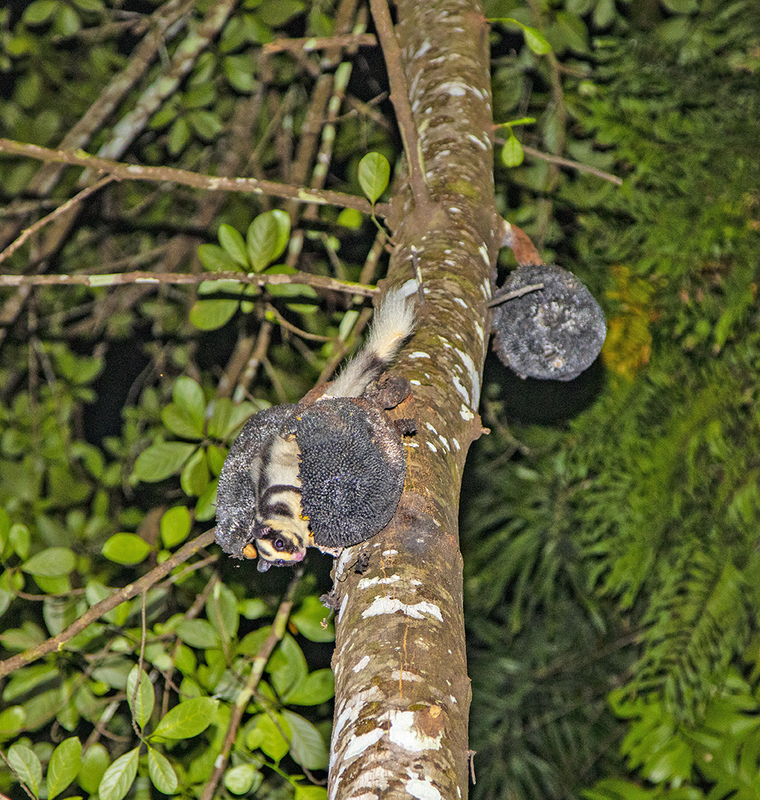 These birds are primarily nocturnal. Their distinctive calls can be heard nightly as they move about of fly up the roads in their habitat in search of insects. They overturn leaves and small bits of wood in search of prey. In addition to insects, they feed on small reptiles, frogs and crustaceans along with a small amount of vegetable material. 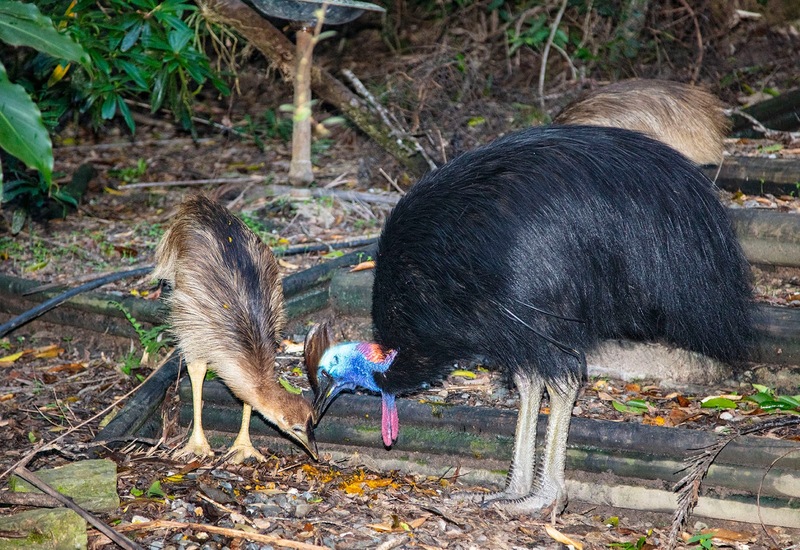 These birds are a lovely part of the tropical environment. Think of the complicated genetics involved in this example. This is the SAME individual katydid from just after hatching to adult. 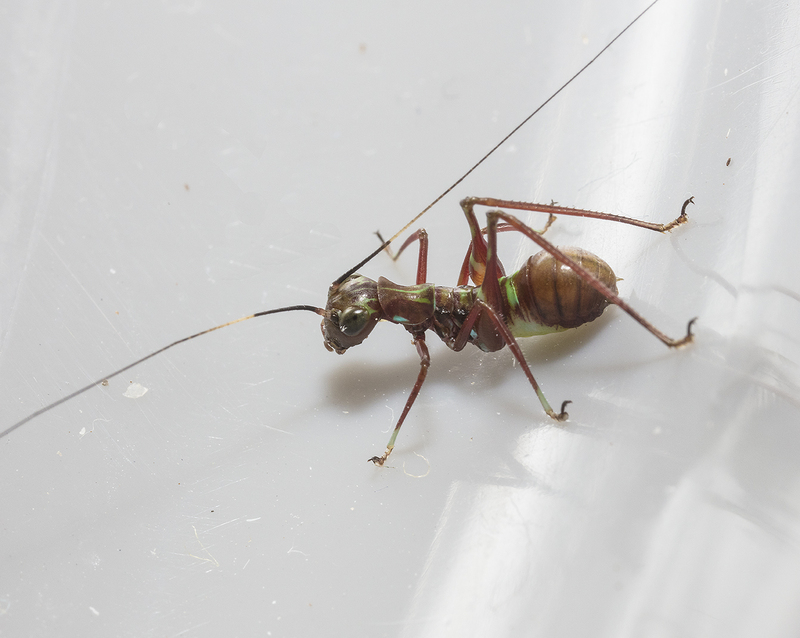 As a first instar nymph (fresh out of the egg) the little katydid behaves much as an ant or a wasp. The antennae flicker when it moves in a wasp-like fashion and its movements are jerky. After a few moults the same katydid looks quite different. 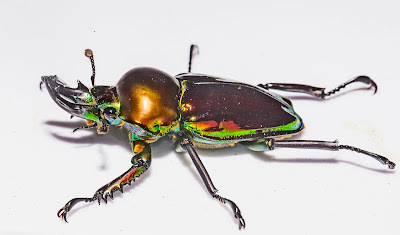 Note the difference in colour pattern and also the antennal colour is entirely black and does not have the white patch near the base of the antenna as is seen on the first instar. Remember, this is the same individual katydid as in the first frame. This is in its last instar stage, just before it moults into the adult. Almost everything about it is different and its behaviour is in now way wasp-like. The colour and pattern on the legs is different and there is not much suggestion of the black colour as seen in the early instars. Note the slightly separated wing pads. This indicates that the individual is about to moult into its adult stage. The adult! It's hard to imagine that this is the same individual at in the first frame after a few weeks time. Most of the intense colours are gone. 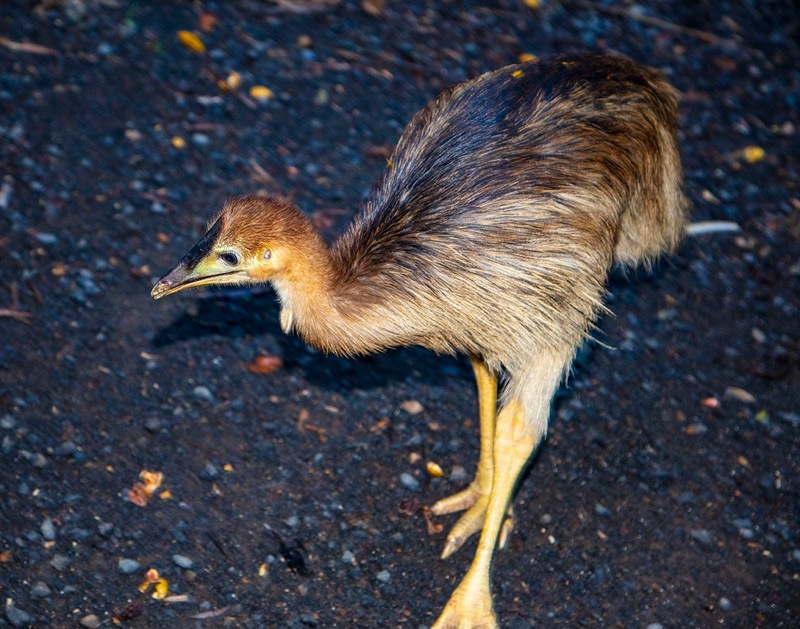 Only traces of orange can be seen on the forelegs and the head. It continues its life amongst leaves and foliage of rainforest trees. 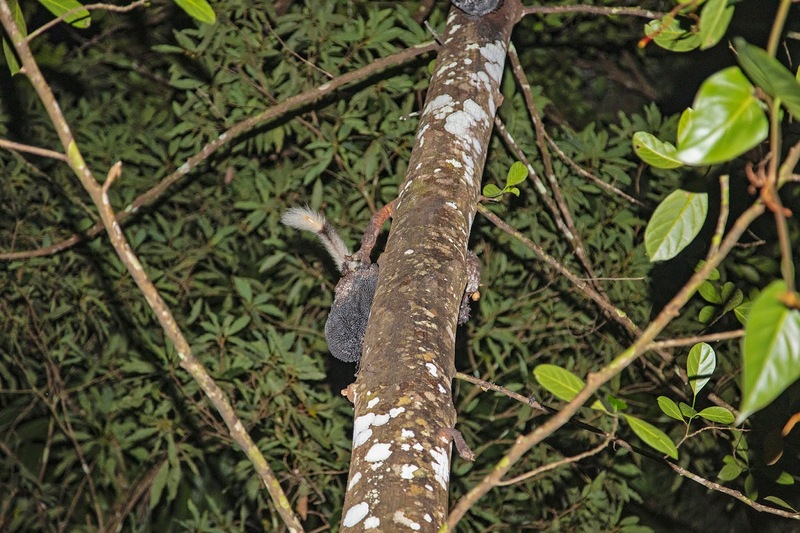 This species bears a characteristic short black stripe on base of the dorsal pair of wings (tegmina). There are also a few scattered small dark spots on the tegmina. So are there explanations for this scenario. It's diverse changes are not just happenstance in my opinion. The wasp-like or ant-like appearance and behaviour of the first instar may help it avoid being predated upon by lizards and birds when it is on the ground or on tree trunks. 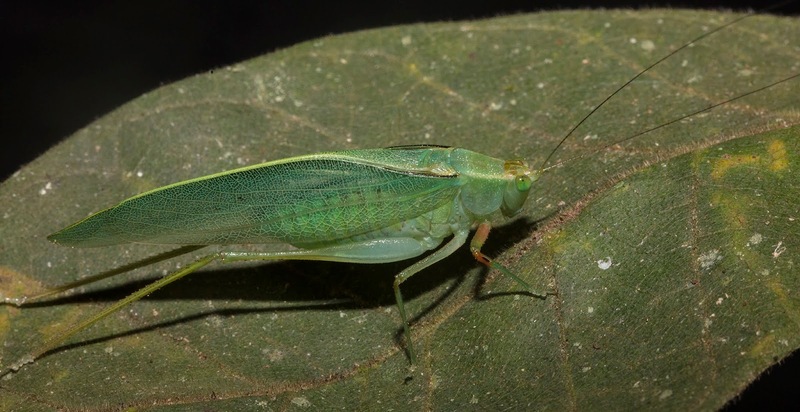 The mid instar appearance might be protective in the sense that it appears more like a piece of bark or leaf litter than an edible katydid. At this stage its movements are jerky and wasp-like. Later instars are probably on leaves during the day and the green colours and patterns conceal it. 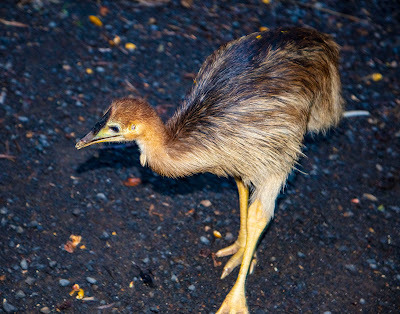 The adult is not unlike any of the more than 10 species of the Phaneropterinae that occur with it. 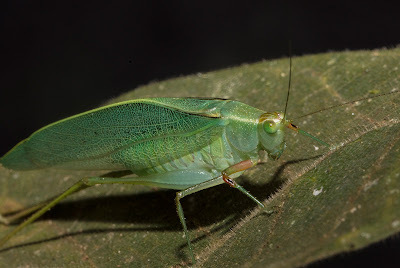 The katydids are nocturnal and spend their time in foliage. They are vegetarians.